Yesterday (April 15, 2019), pastors from the Nor-Cal District visited Chico, Calif., to encourage the staff of Living Hope Fellowship, a Charis Fellowship congregation in that city. 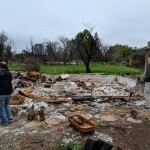 A number of families in the church lost their homes in the Camp Fire in November 2018. 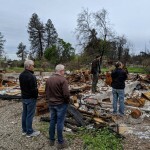 Here’s a report from Phil Sparling, pastor of Auburn Grace Community Church, Auburn, Calif., and the incoming executive director of the Charis Fellowship. 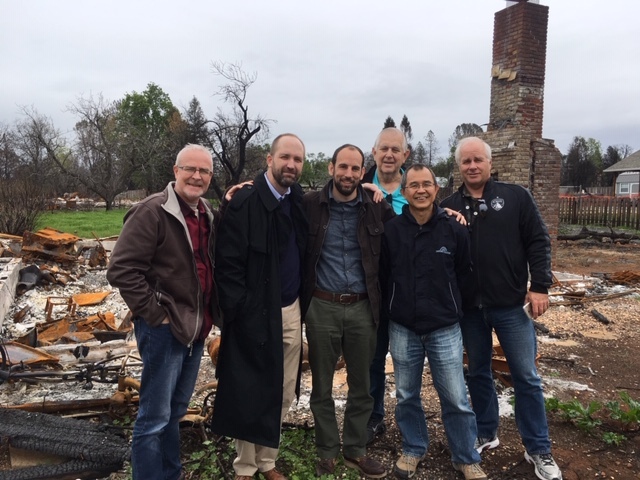 Charis Fellowship pastors in northern California visited the site of the former home of Heath Garrett in Paradise, Calif., on Monday. 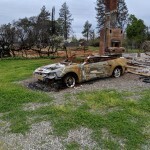 It was destroyed in the Camp Fire in 2019. Left to right are: Dave Wickstrom (executive pastor, Auburn Grace Community Church, Auburn, Calif.), Chris Raley (associate pastor, Living Hope Fellowship, Chico, Calif.), Heath Garret (associate pastor, Living Hope Fellowship), John McIntosh (pastor to seniors, Auburn Grace Community Church), Kevin Ong (missionary at San Francisco International Hospitality House), and Greg Hummel (pastor of body life, Auburn Grace Community Church). 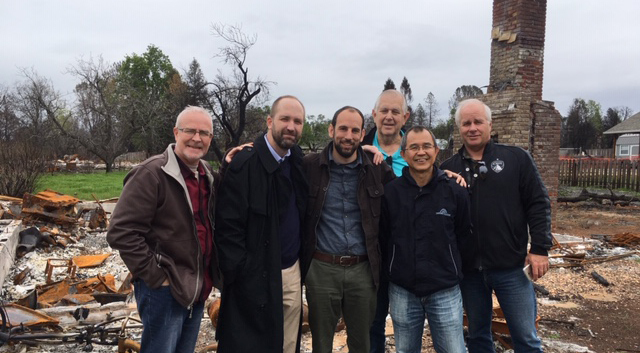 Today a group of pastors from the Nor-Cal district traveled to our Charis church in Chico, Calif., to encourage the staff and see the devastation in nearby Paradise. Eleven families and individuals in our Chico church lost their homes in the fire. A total of 16,000 homes and 350 businesses burned to the ground. As we drove through the area it was apocalyptic in nature. Imagine the physical, emotional, and spiritual toll this has taken on the community. Then double that idea in your head. It have been extremely taxing on the church, staff, and community as a whole. And will be for several ears to come. One bright light is all the kindnesses shown to people in Paradise. The outpouring of care and concern has been just as monumental as the disaster. Our Charis Fellowship sent out a call, through Encompass Crisis Team, to send notes of encouragement, gift cards, and cash to help those in need. The response was incredible. Thousands of dollars was sent in either in cash or gift cards. Many many hearts were touched in the name of Jesus. Thank you Charis Fellowship (and Barb Wooler, director of Crisis Response for Encompass World Partners). As we drove through the neighborhoods we stopped at the former home of Heath Garret, associate pastor at our Charis church in Chico (Living Hope Fellowship). Heath and his wife and two kids woke up that Thursday morning to the sound of rushing wind and burning embers falling from the sky. Heath spent the next few hours helping gather key items and assisting neighbors before the fire was too close and they had to escape. 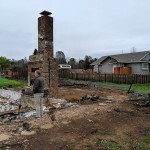 Their home was completely destroyed. Thank you all for your help in time of need. 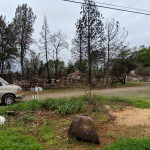 Pastor John McIntosh sent along the images below for their visit to Chico and Paradise, Calif. I'm so glad that you all were able to actually visit Paradise. There's no other way to describe what has happened there. The love that has poured out into that community has been staggering but so much more is yet to be done.